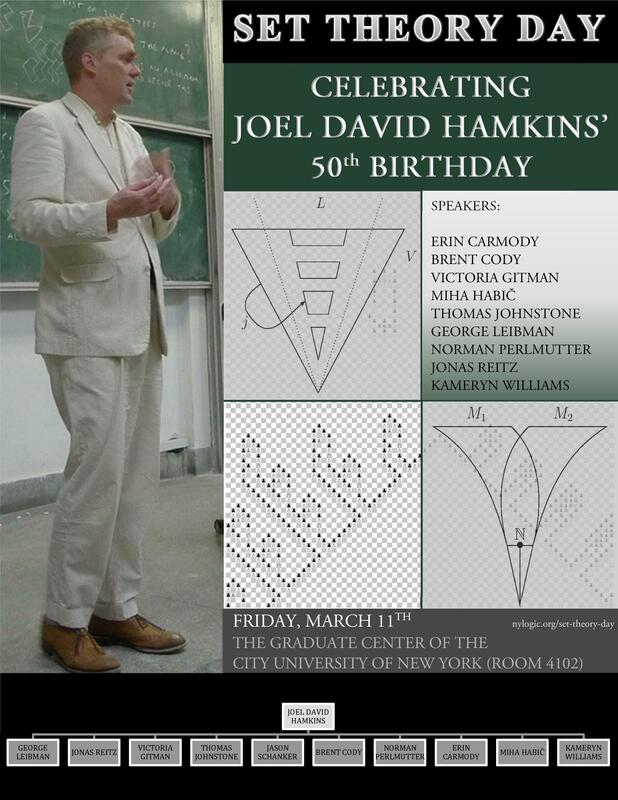 Vika Gitman, Roman Kossak and Miha Habič have been very kind to organize what they have called Set Theory Day, to be held Friday March 11 at the CUNY Graduate Center in celebration of my 50th birthday. This will be an informal conference focussing on the research work of my various PhD graduate students, and all the lectures will be given by those who were or are currently a PhD student of mine. It will be great! I am very pleased to count among my former students many who have now become mathematical research colleagues and co-authors of mine, and I am looking forward to hearing the latest. If you want to hear what is going on with infinity, then please join us March 11 at the CUNY Graduate Center! This entry was posted in Events, Students and tagged Set Theory Day by Joel David Hamkins. Bookmark the permalink. Russell Miller called it, “Hamkins Overflow.” Ha!